1998 was filled with economic events that illustrated the changing and complex agenda for American foreign policy in entering the new millenium. 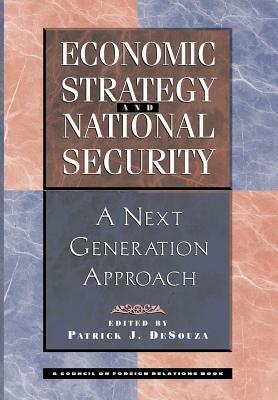 In this volume, former senior members of the Clinton and Bush Administrations and a next generation” of private sector voices set forth and analyze the new intersections between economic strategy and national security. Emerging markets are considered, as well as, new threats and new opportunities that are changing our conception of American security.This book arises from a two-year project by the Council on Foreign Relations, one of the world's premier foreign policy think tanks, to articulate a Next Generation” approach to American foreign policy. The volume is intended for those interested in foreign policy and as a supplement to university-level courses on international relations and business.The financial, trade, technology and regional and sectoral topics covered by this book are especially timely. World financial markets have showed themselves to be increasingly integrated and volatile with the introduction of new information technologies. Global markets for goods have showed themselves to be more fragmented and more difficult to free because of populist concerns over labor and environmental protections. Meanwhile, electronic commerce will change international economic relations. Regionally, Asia and Russia  our post-Cold War focus - are in collapse. Latin America, our fastest growing market and prospective 21st century focus, is teetering due to the lack of foreign reserves.In addition to these changing dynamics, new economic threats such as corruption and information terrorism counter-balance new opportunities to influence the world through American know-how in technology and venture capital.As evidenced most clearly by the October 1998 vote on Fast Track trade authority for the President, domestic audiences seem to be fueled more by negative messages brought by economic nationalists” than those who seek a more internationalist” approach. This communications reality is dangerous and requires attention by the new generation of American leaders who will begin their run for the presidency by the time the book reaches the shelves.This book begins to outline new concepts - political, economic and philosophical  for American foreign policy in the 21st century. In addition, it seeks to drive home the need for the American people to better understand our likely engagement in the new world upon which we are embarking. Patrick J. DeSouza is a banker with Violy, Byorum & Partners Holdings LLC - an investment bank focused on Latin America. During 1997-98, he served in the White House as a Director for Inter-American Affairs on President Clinton's National Security Council. He is a graduate of Columbia College, Yale Law School and Stanford Graduate School. He has been a senior editor on the Yale Law Journal and editor-in-chief of the Yale Journal of International Law. In addition, Dr. DeSouza has been a term member, international affairs fellow and the inaugural "Next Generation" fellow at the Council on Foreign Relations. He is the author of several articles on foreign economic policy and law.